vacancies in this recruitment of WAPCOS. Currently, these vacancies are contract basis only for its ongoing projects in Andhra Pradesh and other North Indian Last date to reach the filled application form to WAPCOS is on or before 07-10-2017. Candidates who are having the relevant experience they can apply for this WAPCOS Recruitment of Draftsman and Site Engineer Jobs. For more details regarding this WAPCOS Recruitment Notification 2017, various posts is given below. Candidates will be selected based on their experience and Personal interview. Preference will be given to the experience having candidates. 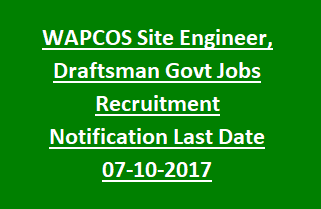 Eligible and Interested candidates may apply for this WAPCOS jobs on or before 07-10-2017. CV Should be submitted in a prescribed format and also attach the supporting documents such as qualifications, date of birth proof, experience certificates, and other related documents. On cover letter mention clearly post name which you are going to apply.